The May meeting of the Mid-Michigan Photography Club is scheduled for 6:30 p.m. on Wednesday, May 2, 2018 at the First Presbyterian Church, 510 W Ottawa St, Lansing, MI. Don’t miss our meeting with special Guest Speaker Greg Smith. Greg is always a feast of information for those who love trekking and tracking our fine Michigan feathered friends. If you don’t love birding, you might change your mind after seeing Greg. Thanks to all who have contributed to the MMPC Photo Challenge. A reminder that the April theme is Reflections. The May theme will be Symmetrical. Galleries of the photos are on the web site at http://mmphotoclub.com/monthly-challenge/. The March photos will be added at the end of the month. If you do not use the Facebook group, send your entry by email to mmpclansing@gmail.com so that we can post it to the Facebook page. Discussion of the photos, beyond simply liking the picture, is encouraged. MMPC is planning an Upper Peninsula Waterfalls Weekend during the weekend of October 12, 2018. A trip to the Big Sable Lighthouse is being planned for January or February 2019. Congratulations to Randy Eberbach, Judge’s Choice and Arlene Allan People’s Choice for their March winning entries with the theme of Funny. Those images are now in the gallery at http://mmphotoclub.com/competitionbig-cookie/. The theme for the next Big Cookie competition in June 2018, is Buildings. 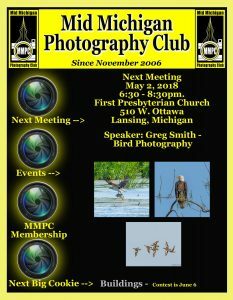 The May meeting of the Mid-Michigan Photography Club is scheduled for 6:30 p.m. on Wednesday, May 2, 2018 at the First Presbyterian Church, 510 W Ottawa St, Lansing, MI. Greg Smith will present on birding.